When you have created the perfect design for your photo book pages, you can save the layout in our offline creator tools. That way you can easily use the same layout again! You can even export your saved layouts to another computer. We’ll show you how to do it! First, select the page with the layout that you want to save. Under the ‘page‘ tab, select ‘save layout‘. Or click on ‘my layouts‘ at the left and then click on ‘save layout‘ at the top. You can find your saved layouts under ‘my layouts‘ at the bottom left of your screen. Just drag the layout to the page to use it again. How can I export my layouts to another computer? You can export your saved layouts into a file on your computer. You are then able to transfer that file to another Windows computer and import them into the bonusprint software. 1. Within the creator tool, open the tab ‘Help and Options‘ and click on the ‘Settings‘ menu. 2. 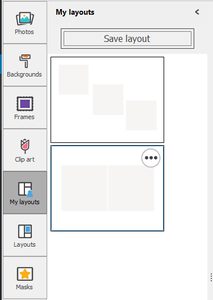 Open the tab ‘Advanced‘ and select ‘Export my layouts‘ (marked with a red line). 3. A pop up window will appear where you can select a location to save the file (we recommend ‘Desktop‘ as an easy to find option). 4. If you need to move the file to another computer, save it onto a USB or external harddrive and then import the file onto the other computer. 5. Open the creator tool on the computer you imported the file to and open a new or existing photo book. 6. Open the tab ‘Help and Options‘ and click on the ‘Settings‘ menu. 7. Open the tab ‘Advanced‘ and select ‘import my layouts‘ (marked with a green line). A pop-up window will appear. 8. Navigate to the location of the saved layouts-file in the pop-up window and select ‘open‘. Your saved layouts will now be imported. Once the layouts are imported you can find them under ‘my layouts‘ in the offline creator tool. 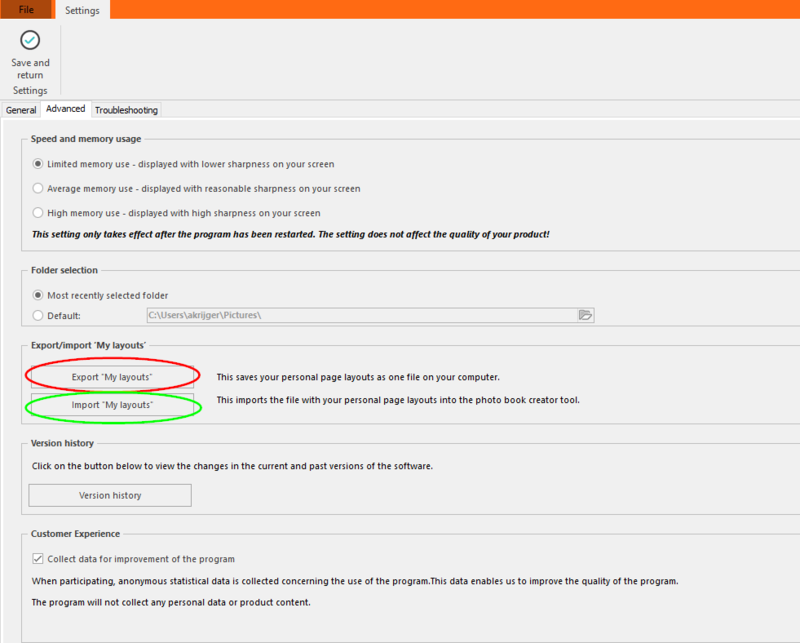 First, select the page with the layout that you want to save. Go to the ‘page‘ tab in the taskbar at the top of your screen or use the buttons above your photo book preview. 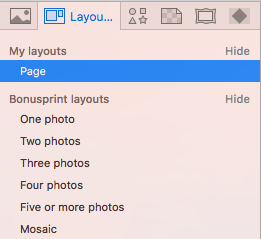 Choose the option ‘save page layout‘ at the left to save the single page or ‘save spread layout‘ at the right to save the double page spread. You can export your saved layouts into a file on your computer. You are then able to transfer that file to another Mac computer and import them into the bonusprint software. 1. Open the creator tool and click on ‘file‘ in the taskbar at the top of your screen. 2. 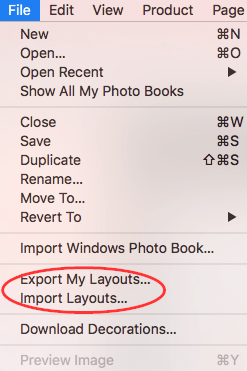 Select ‘Export my layouts‘. A window will appear where you can select a location to save the file (we recommend ‘Desktop‘ as an easy to find option). 3. If you need to move the file to another computer, save it onto a USB or external harddrive and then import the file onto the other computer. 4. Open the creator tool on the computer you imported the file to and select ‘import Layouts‘ under ‘file‘ in the taskbar. 5. A window will appear where you can navigate to the location of the saved layouts-file. Select ‘open‘. Your saved layouts will now be imported.